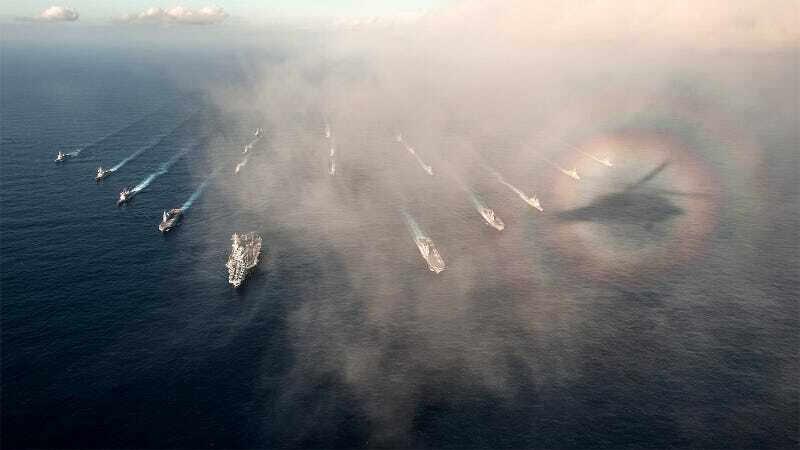 For those who equally enjoy U.S. Navy photography and atmospheric optics, this photo is a gem. This is the Ronald Reagan Carrier Strike Group in formation with Japan Maritime Self-Defense Force ships, shrouded in a fog-based light show. Thanks to the phenomenon called solar glory, you can see on the right side of the picture the shadow of the photographer’s helicopter, surrounded by three concentric halo-like rings. They’re caused by the light of the Sun shining from behind the aircraft, interacting with the tiny water droplets of the mist. Nice, eh?